Razor wire surrounds Hanford's makeshift borders while tattered signs warn of potential contamination and fines for those daring enough to trespass. This vast stretch of eastern Washington, covering more than 580 square miles of high desert plains, is rural Washington at its most serene. But it’s inaccessible for good reason: It is, by all accounts, a nuclear wasteland. During World War II, the Hanford Reservation was chosen by the federal government as a location to carry out the covert Manhattan Project. Later, plutonium produced at Hanford provided fuel for the “Fat Man” bomb that President Truman ordered to be dropped on Nagasaki in 1945, killing upward of 80,000 Japanese. In all, nine nuclear reactors were built at Hanford, the last of which ceased operation in 1987. The US Environmental Protection Agency now estimates that as a result of the nuclear work done at Hanford's facilities, 43 million cubic yards of radioactive waste were produced and more than 130 million cubic yards of soil ultimately were contaminated. During Hanford's lifespan, 475 billion gallons of radioactive wastewater were released into the ground. Radioactive isotopes have made their way up the food chain in the Hanford ecosystem at an alarming rate. Coyote excrement frequently lights up Geigers, as these scavengers feast on varmints that live beneath the earth's surface. Deer also have nuclear radiation accumulating in their bones as a result of consuming local shrubbery and water. The EPA has deemed Hanford the most contaminated site in North America — a jarring fact, as the Columbia River, lifeline for more than 10,000 farmers and dozens of commercial fisheries in the Pacific Northwest, surges along Hanford's eastern boundary. The US Department of Energy (DOE), the agency that oversees energy and the safety of handling nuclear material, supervises the cleanup efforts, which are currently undertaken by Bechtel National Inc. — infamous for its mishandling of Iraq reconstruction efforts — and a handful of other companies like URS and CH2M HILL. But despite more than two decades of cleanup efforts and billions of dollars spent, only a tiny fraction of Hanford's radioactivity has been safely contained. And the final costs for the Hanford cleanup process could exceed $120 billion — higher even than the $100 billion tab for the International Space Station. Now outrage is brewing at Hanford. Some prominent employees working on the project are blowing the whistle over what they believe to be dismissals of internal scientific assessments, as well as alleged abuses of managerial power that have been called to the attention of the Obama Administration, to no avail. These staffers point to institutional failures within the DOE and Bechtel as toxic as the nuclear waste they're tasked to clean up, asserting that the DOE lacks critical experts on staff to oversee the project and Bechtel rushed through shoddy design plans in order to pocket some quick cash. The consequences are not only jeopardizing safety and putting the project at risk of failure, they are also likely to cost taxpayers even more money should fatally flawed construction ultimately require a complete overhaul. It's the tail end of summer, and Alexander is about to head off on a weekend camping trip with his son in northern Idaho. While his spirits are high at the thought of his upcoming retreat, Alexander somberly assesses the Hanford situation from his vantage point. Alexander knows his nuclear disasters well, as he led one of the DOE's first scientific delegations to Russia's Mayak nuclear facility in 1990. Mayak, one of the largest nuclear production plants in the former Soviet Union, suffered a deadly accident in 1957 when a tank containing nuclear materials exploded. The Mayak facilities are comparable to the plutonium production units built at Hanford, which is considered a “sister facility.” Since they are so close in design and makeup, Mayak is often seen as an example of what can go wrong with the production of plutonium and the storage of nuclear waste at Hanford. Alexander's team negotiated the transfer of data collected by the Soviets on the health effects of Mayak's radioactive release, establishing a program that allows Russian and U.S. scientists to share nuclear cleanup technologies and research. Currently, federal employees at DOE headquarters in Washington, D.C., are evaluating whether Bechtel's construction designs at the site have violated federal law under the Price-Anderson Amendments Act (PAAA). An amendment to the Atomic Energy Act of 1954, the PAAA governs liability issues for all non-military nuclear-facility construction in the United States, which includes Hanford. It's not just the DNFSB that is concerned with the safety culture and management at Hanford. Seattle Weekly has obtained official documents revealing that the Government Accountability Office (GAO), the Congressional arm in charge of investigating matters relating to contractors and other public fund recipients, visited the Hanford site last month. In an outline sent to DOE personnel in advance of their visit, the GAO wrote that it will look into how contractors are addressing concerns over what they call “relatively lax attitudes toward safety procedures,” “inadequacies in identifying and addressing safety problems,” and a “weak safety culture, including employees' reluctance to report problems.” Their findings likely will be made public in early 2012. These flawed plans flew under the radar because the DOE does not have enough staff to thoroughly review every design piece put forth by Bechtel, says Alexander. As a result, expensive mistakes like these could occur again. The lack of key staff to oversee Bechtel's work continues to plague the WTP project to this day. The concerns of the GAO, the DNFSB, and Alexander all point to a flawed relationship between the DOE and Bechtel, which is both the design and construction authority on WTP. Once operable, the plant will turn the millions of gallons of radioactive sediment currently in the site's waste tanks into glass rods by combining the toxic gunk with glass-forming material at a blistering 2,100 degrees Fahrenheit — a process called vitrification. The rods will then be shipped to an offsite location to be stored indefinitely. Bechtel's contract is what is known in contractor parlance as “cost and schedule performance based.” Such contracts, standard in the defense world, reward contractors like Bechtel for “meeting milestones” within their proposed budget — in some instances, even if plans and construction turn out to be critically flawed. Despite certain mistakes, including those made during the first three years of building the WTP with seismic deficiencies, Bechtel boasted in 2004 that they had received 100 percent of the available milestone fees available to the company through their Hanford contract with DOE. There is something ominous about Hanford, and it's not just the radioactivity. 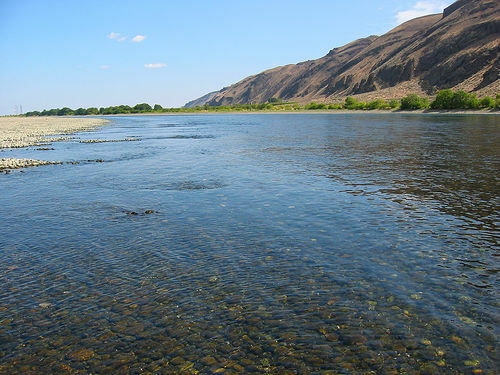 The Wanapum Tribe, which survived here for centuries, feasting on the once-mighty Columbia River salmon runs, was evicted less than 70 years ago by the federal government so the feds could manufacture fuel for the A-bomb. It was certainly a marvelous scientific achievement when the first plutonium rolled out of Hanford's B Reactor, which is now just one of the many structures that haunt this dry landscape. But cleaning up Hanford's aftermath may prove even more of an accomplishment than it took to create the nuclear reservation in the first place. Richland, population 48,000, is the city closest to Hanford. Local bars on the weekends overflow with Hanford contractors, and the cash they put down for shots and rounds of cold beer is abundant. The local watering hole, aptly named the Atomic Ale Brewpub, is decorated with Hanford artifacts and memorabilia, and serves beer like Plutonium Porter and Jim's Radioactive Rye. Richland High School's mascot is the Bombers. Despite its toxicity, locals have evidently embraced Richland's nuclear lore. Richland's economy has long been sustained by the nuclear industry. Before the current cleanup of Hanford began to bring money into the community, the development of nuclear technologies ruled the town for decades. Just outside a more upscale neighborhood is a sprawling industrial park that serves as the district office for Hanford contractors and DOE employees. Without Hanford contracts employing thousands, Richland certainly would be struggling. During the Cold War, while Hanford was operating at full capacity, Richland received the brunt of the site's radioactive pollution. As plutonium production reached its peak in the mid-1950s through the mid-1960s, plant operators at Hanford were told to ignore wind patterns, and released toxic debris into the air throughout the day. As a result, the cities of Richland, Pasco, Kennewick, and Benton City all exceeded acceptable levels of radioactive contamination. During a more devastating period, such as the December 1949 “Green Run” when raw uranium fuel was being processed, a winter storm struck the region, causing heavy radioactive deposits to snow down on Richland and other rural farm communities. Samples of radioactivity taken during the Green Run incident were 1,000 times the government's recommended level, potentially impacting tens of thousands of people. Today there are a total of 177 underground storage waste tanks at Hanford, 149 of which are single-shelled and considered leak-prone by the EPA. All together, these holding containers house 53 million gallons of scorching-hot radioactive goop — nearly two-thirds of the country's high-level, defense-related radioactive waste. Many of these tanks are already leaking, and have been for some time; according to the Washington Department of Ecology's estimate, one million gallons of nuclear waste have already poisoned groundwater as it continues to seep toward the Columbia River. However, it is not only leaks that haunt Hanford's scientists and engineers. The longer the waste stays put, the more dangerous it becomes. Alexander is openly concerned that such an event could release dangerous amounts of radioactive material into the atmosphere, contaminating nearby towns and destroying much of Washington's vital agricultural economy. And despite Hanford's already seething radioactivity, the DOE is eyeing the site as a potential waste repository for additional radioactive garbage produced from medical procedures, including cancer treatments, as well as waste associated with oil and gas exploration. Bechtel has held the rights to build WTP since 2000. The plant, like Bechtel's Hanford contract, is gargantuan. The equivalent of constructing two full-scale nuclear power plants, WTP is to one day span 65 acres and include four major nuclear facilities: Pretreatment, Low-Activity Waste Vitrification, High-Level Waste Vitrification, and an Analytical Laboratory. It's currently the largest single construction operation taking place anywhere in the United States. Not only is the proposed WTP immense, it also comes with a staggering price tag of $12.2 billion, funded solely by the public trust, part of which comes out of the annual DOE budget. Before Bechtel, the DOE's WTP contract was with British Nuclear Fuel Ltd. (BNFL). But in May 2000, after the company estimated they would spend more than $14 billion — despite an earlier cost estimate of $7 billion — the DOE ended the contract. Bechtel was then awarded the job through a competitive contract bid, receiving a $4.3 billion deal when it assured the DOE it could do the work for less than British Nuclear Fuel's price. Since then, however, the company's cost estimates, start dates, and deadlines have changed on numerous occasions. Bechtel has also swapped project presidents on four separate occasions, most recently installing Frank Russo as director in January 2010. Originally, WTP was to begin turning Hanford's radioactive materials into glass by 2011, with all vitrification to be completed by 2028. But in 2007 Bechtel pushed up their original cost estimates to $12.2 billion and their deadlines to start the vitrification process to 2019. Even if they meet this goal, the job will not be finished until 2047. The timeline and cost projections have constantly changed because of poor management decisions and a rush to fast-track completion, say critics, as was the case with the redesign of WTP based on its seismic preparedness. “Bechtel, by all accounts and purposes, has done an absolutely miserable job,” says Tom Carpenter, the professorial executive director of Hanford Challenge, a Seattle-based nonprofit watchdog group that keeps a close eye on all things Hanford. “They [the DOE] simply don't have enough [personnel] to deal with all the technical challenges, so Bechtel is getting away with whatever they want out there.”In fact, Bechtel has hundreds of engineers and scientists on the project, compared to less than a dozen for the DOE at Hanford. “There are only a few [technical staff] in the Engineering Division,” Alexander says. “And there are about seven of us in the Nuclear Safety Division where I work.”Furthermore, an internal DOE document published in August by the Construction Project Review (CPR) states that the current $12.2 billion estimate, which increased in 2007 after the DOE revised their WTP goals, is likely to climb yet again. “Funding uncertainty is the major project risk,” the document notes. These increases, says Carpenter, are directly related to the DOE's inability to manage Bechtel. Like Alexander, McNulty is worried that there will be no turning back once the vessels become operable because the radioactivity within them will be too high for workers to enter the black cells — meaning that all mechanisms' interiors, from the vessels to the piping, will have to last the lifetime of the machine. Any malfunction of any part would end the vessel operation altogether, creating a potentially deadly nuclear accident. Alexander's tests of the pulse jet mixer design plans showed that the model was faulty, yet his pleas to stop construction have gone unheeded by his DOE Project Director, Dale Knutson. In early August, the DOE announced that it was moving forward with welding the tops on the vessels, much to Alexander's dismay. In other words, even though no small-scale tests have ever shown that the pulse jet mixers will work properly, Bechtel, with the DOE's blessing, will still move forward with welding the heads to the tops of the vessels. Shortly after he refused to counter Alexander's internal paper warning about the problems with the pulse jet mixer design, Tamosaitis blew his own whistle, exposing what he saw as safety failures at WTP and citing concerns that the pulse jet mixer design issues would prohibit the plant from operating correctly. As a result, Tamosaitis says he was removed from the project; Bechtel and URS both deny that they removed Tamosaitis because he raised safety concerns. In an e-mail dated March 31, 2010, Russo updated President Obama appointee Inés Triay on the situation. Triay, who did not return calls seeking comment, served as Assistant Secretary for Environmental Management and oversaw the DOE's Hanford work until July, at which time she stepped down. “This action [Tamosaitis' removal from the Hanford project] was initiated by Dale Knutson probably not knowing the sensitivity,” Gay e-mailed to another employee in response to the decision to get rid of Tamosaitis. While no longer working on Hanford and WTP, Tamosaitis is still employed by URS, but is confined to a windowless basement office in Richland, where he says no management has spoken to him in over a year. His daily work routine isn't that of a normal URS scientist, and he is not even sure what official title he presently has. URS has recently shipped him around the country to work on various company projects as a sort of in-house consultant. Three sources working on the DOE's and Bechtel's Hanford vitrification project tell Seattle Weekly that “the WTP project is in total jeopardy” because of their employers' refusal to address technical and safety concerns raised by staffers like Tamosaitis and Alexander. These sources, who asked to remain anonymous for fear of retribution by their employers, believe congressional hearings in front of the House Energy and Commerce Committee about the issue are imminent. They also contend that the project could be temporarily shut down any day due to safety concerns. If it comes to rebuilding these hundred-million-dollar vessels, the costs will skyrocket. As a result, Hanford Challenge's Carpenter and others note, the entire project could fall apart. That means taxpayers will again have to foot the bill for WTP's redesign and construction, postponing its operation indefinitely.